The Attic Lodger | Random thoughts worth thinking, offered humbly and prayerfully. You may be interested in this review of Graeme and Jonathan Rutherford’s book, that I referred to in my recent post. I am not often moved by a book, not one of this genre. I am intrigued, challenged, educated, infuriated or bored, but rarely moved. Pitting the perspectives of atheism and religious faith against each other can be occasionally stimulating, often frustrating, but moving? Hardly. This book is different. My fifth and youngest child, and only daughter, is to be confirmed this Sunday at St. Paul’s Cathedral. She will also be baptised—the final legacy of our Baptist roots, now so far-off, and so foreign to us. Surely the finest Father’s Day gift ever, to see my beloved daughter embrace the Christian faith in so graphic and public a way. We hope for this. We pray for this. We are overjoyed, and give praise to God, when it transpires. Yet it is only the beginning, and so much may change in the years ahead. We all know of faltering faith. Belief can hang on a slender thread—for most of us it has been so at some point in our journey. Prayer must never cease! Bishop Graeme Rutherford, with son Jonathan. There is such a precariousness here. 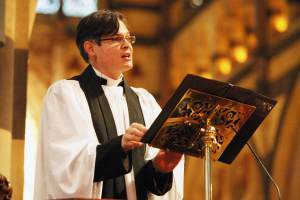 It was brought home to me with the news that Bishop Graeme Rutherford would lead the confirmation service, in the absence of Archbishop Philip Freier. 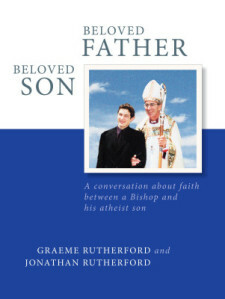 Bishop Graeme co-authored with his son Jonathan a book entitled Beloved Father Beloved Son: A Conversation About Faith Between a Bishop and His Atheist Son. Yes, Jonathan Rutherford is an atheist, despite his Christian upbringing. I mean to read this book, which I am told poignantly and touchingly demonstrates the love and mutual respect that exist between father and son, despite deep differences over questions of faith. Of course, reflection goads me to pray for my daughter, and her four brothers. I pray that this faith once professed will not grow cold, or wither and die. Yet at the same time I pray that God would grant me the grace to continue in pure and godly love towards them, and trust always in his faithfulness and love, whatever future course my children’s lives might take. In my last post I reflected on the then-upcoming inauguration of Archbishop Philip Freier as Primate of Australia—all the excitement surrounding preparations, and particularly over Archbishop of Canterbury Justin Welby’s involvement. And I asked, Why fuss so much about mere men? Why draw attention to mere servants of Christ, attention that rightly and properly belongs solely to Christ himself? Pray that their witness will be faithful always to the gospel of Christ. Pray that they will proclaim Christ, crucified and risen, without fear or favour. Pray that the Holy Spirit will fill and empower them to be godly and faithful servants of Christ and his church, walking always in the way of wisdom, justice and truth. I was encouraged by these words this morning. An appeal – on the basis of Scripture – to my Sydney friends to re-think their position on women, ministry and authority, Part 1. An appeal – on the basis of Scripture – to my Sydney friends to re-think their position on women, ministry and authority, Part 2. Worthwhile reflection on the recent decision by the Church of England to allow woman bishops. A conclusive result for them. For many, agonising and deep angst over this and other divisive issues continues. I pray there will be an end, and we can get on with the real work of the gospel. Christ have mercy on us. Interestingly though, when Paul talks about the order of positions within the Church in his letter to the Corinthians, he places apostles first, prophets second and teachers third. This was all about mission as the Gospel spread rapidly throughout the Roman empire.